My previous post on the related topic. I revisited the above fabrics in another experiment recently. This first sample was produced as a hand technique after casting on with 2 needles in work, 2 out of work. 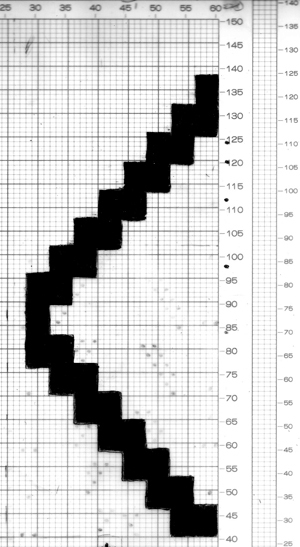 In the bottom half there were variations from 8 down to 4 rows of knitting before additional groups were introduced, beginning on right side of machine, with the first group on right taken out of work after bringing the second on left into work and one row knit on both groups, so sequences are always on single groups of 2 except for the one row where the new pair is brought into work and knit. 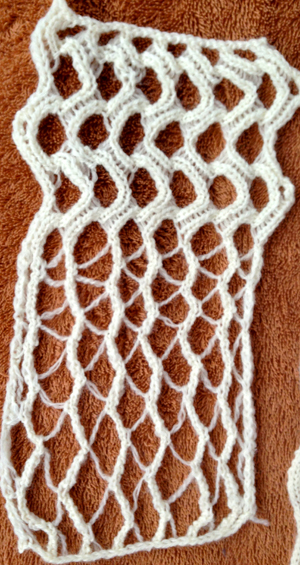 When proceeding in this manner the single long float will appear between the lines of knit stitches. 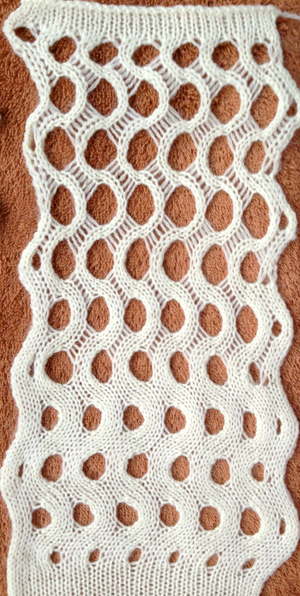 The top of the swatch was knit in a manner similar to the method described for the second swatch series in the above post. The yarn is an acrylic, barely steamed. Automating these fabrics is limited if only a punchcard or mylar were available. In the repeat below if all “holes at edges” were wanted to match the size of those in the remainder of the row, the single 4 stitch segment areas would need to be redrawn, double their present length. Though the width of the fabric may be limited in terms of a garment or shawl, an inset is possible, or if turned sideways, the fabric may serve as a trim. Having an interface that allows programming the width of the needle bed and “infinite” length, gives one much greater leeway also in terms of segment widths. Here I am basing the repeat on groups of 4. The grey markings are ghosts from a previous test repeat. The resulting fabric was 32 stitches wide, centered on the machine; in the bottom segment all needles (in my case 16L to 16R) are in work, KCII (cancel end needle selection) row is from left to right, with knitting beginning from right to left, with machine in turn set to slip <—>. Adding NOOW creates 2 more variants. In the middle the the fourth stitch on the left of each group is transferred to its right, its corresponding needle taken out of work, so knitting will be on groups of 3 stitches, with a single needle ladder between them; in the top the third needle on left of each remaining group of stitches is transferred to its right, now having groups of 2 empty needles between each pair of stitches, creating a wider ladder.This swatch was lightly pressed, flattening it considerably: a consideration when choosing yarn type. Simply doubling the length and width of the repeat on the mylar, which in theory should give a larger repeat, does not work for these fabrics: the transition row as each new group is brought into work needs to be a single row event or floats will be created on the second pass of the carriage, so this in one instance of draw exactly what you want to knit unless you wish to manage the floats created by changing those needle selections manually when needed if doubling motif length. I’m not one to make comments on articles very often, but this information really spoke to me. It’s interesting and invaluable content presented in a very unique way. Thank you.